A company’s brand identity is the foundation upon which their company is built. It is the way that people identify them, and identify with them. Young Automotive Group’s mission statement, “we take pride in delivering an exceptional experience while generating a fiercely loyal following that loves to think young,” is at the core of our branding efforts. One of the key components of Young Automotive group’s marketing effort is to deliver a fantastic customer experience. This entails more than just generating leads and selling cars. We make sure every store looks top notch and every department has all that they need to deliver value to their customers. Young Automotive Group is highly involved in the communities that surround their stores. We help them bring their A game to events put on by other organizations, and we help them put on fantastic events and fundraisers themselves. 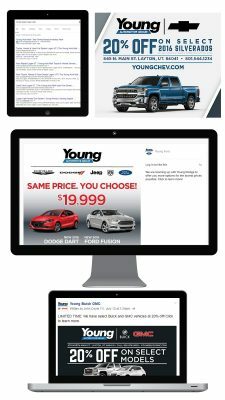 Young Automotive Group would not be able to deliver the experience they do and be as much of a part of the community as they are without powerful, trackable direct response marketing. We have helped them to find the most profitable lead and sale generating advertising sources, focus on the key metrics that make those advertising source profitable, and scale those advertising sources to generate more leads and sales.